This report analyzes virtual infrastructure configuration changes and provides detailed information on changes performed for each object within the reporting period. The report allows senior IT administrators to get details on recent infrastructure modifications made to target objects so that any unwanted action can be quickly rolled back. Interval/Start Date-End Date: defines the time period to analyze in the report. Note that the reporting period must include at least two data collection sessions for the selected scope. Otherwise, the report will contain no data. Object type: defines a list of infrastructure objects to analyze in the report. To select multiple items, use the [CRTL] or [SHIFT] key. 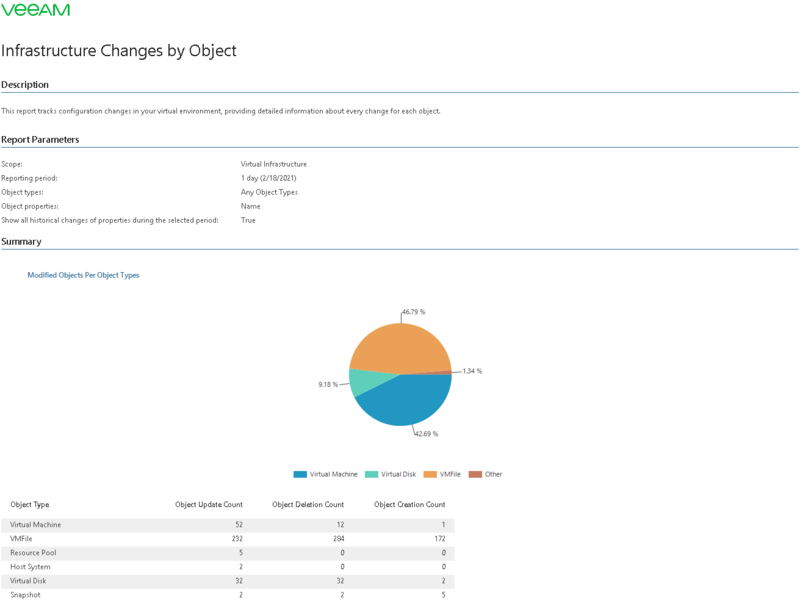 Object properties: defines configuration properties for which the report will track changes. The list of available properties will depend on the selected object type. Use the Filter field to search for the necessary properties by name. Include all historical changes to the object for the selected interval: defines whether to include in the report all historical changes for the specified time period.